Pushing yourself in the gym to be the best you can be is never easy, but this belt has the support you need to make those gains. Choosing the right size and style belt can be tricky, but custom ordering one can make the process much easier. Talk with me about your lifting style and preferences and I will work to make sure you get the perfect size and style belt for your heavy gym days. 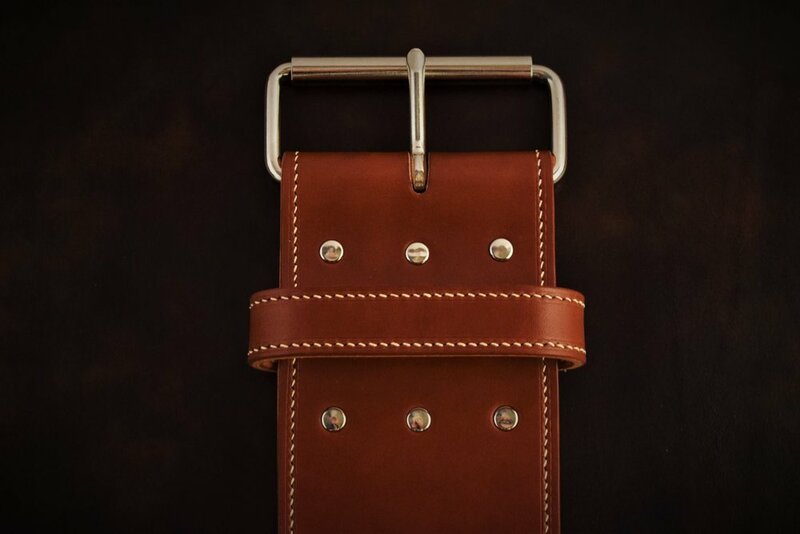 Made from your choice of English bridle, or harness leather, these belts will stand out and handle whatever you throw at them. Sourced from the renowned Wickett & Craig Tannery in Pennsylvania, these top shelf leathers have a firm temper that provides strong back support and will break-in over time to fit your body exactly. The standard option for these belts is 10mm thick, providing plenty of support for the typical gym-goer, but can be made thicker or thinner to suit your preferences. Modifications can be made for olympic style lifting or shorter torsos--anything to make sure it fits just right. Hand sewn for additional durability, you can be sure you're getting your last lifting belt. Lifting belts are made to be worn tightly around the mid-section, more or less centered around the belly button, not loosely around the hips. This ensures proper core support and stability that will help perform the movements. In order to create the best fit, I will be asking you for the measurement around your midsection. If you know, what is the measurement of your midsection, around the line of your belly button?